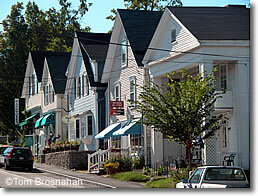 Blue Hill, Maine is a town of majestic elm trees, with prim white clapboard homes and churches. Blue Hill, Maine (map) attracts visitors because its most outstanding "attractions" are peace, quiet, summer chamber music, and an easy pace. The town was settled in 1762 by colonists from Andover MA, and by 1792 Blue Hill's citizens were turning Maine's forests into ships, and were sending these ships around the world. In 1816 granite quarries were opened, and stonecutting complemented shipping. From 1879 to 1881, there was also a copper mine here. Today, if you're not coming to Blue Hill on vacation, you're probably coming to enroll your child in the George Stevens Academy (1803), a preparatory school. Or perhaps you've arrived to attend a chamber music concert in Kneisel Hall, performed by students and faculty of the summer music school twice weekly in July and August at 8 pm. You may want to visit the Holt House (1815), home of the Blue Hill Historical Society, open in July and August, Tuesday through Friday from 1 to 4 pm. The stocky but dignified four-chimney home remains much as it did during Federal days. Take a look also at the pretty stained-glass windows in the First Congregational Church. Blue Hill has a small collection of good inns and restaurants to accommodate summer visitors.